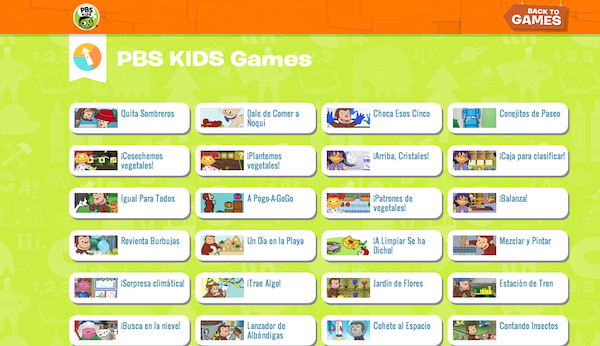 PBS KIDS Launches Over 25 Online Games in Spanish! This is one announcement that has us incredibly excited and hopeful that the mission we’ve all embarked in together to teach Spanish to our children is being taken seriously by those companies we rely on for educational and entertainment resources for them. 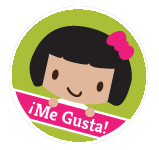 We’re thrilled to be PBS KIDS Parent Ambassadors and be able to break the news to you that they just announced more than 25 PBS KIDS games are now available in Spanish. 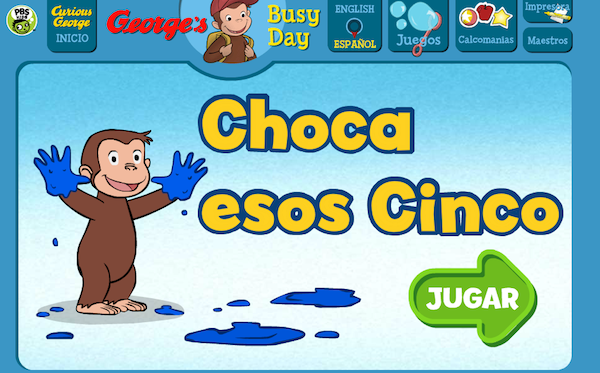 Join the Cat in the Hat, Curious George and Sid the Science Kid for fun games and stickers en español. ¡Qué emoción! Join George on his very busy day as he learns about numbers and counting and is introduced to addition and subtraction. Check out the science fair displays with Sid and his friends, and play games that involve measuring (temperature, weight, and size), sorting, symmetry, addition, and finding patterns. Help the Cat in the Hat collect the missing pages of his Animal Safari Book. You’ll have to use shape recognition and spatial skills, counting and measurement. The games are all enhanced with researched-based improvements to level selection and instructions. ESL students or children learning Spanish will learn math skills that will benefit them not only at home, but also in the classroom. The games are part of the Ready To Learn Initiative, an early learning project of PBS KIDS and the Corporation for Public Broadcasting (CPB), funded by the U.S. Department of Education to support the development of early math and literacy skills in children ages 2-8, especially those from low-income families. 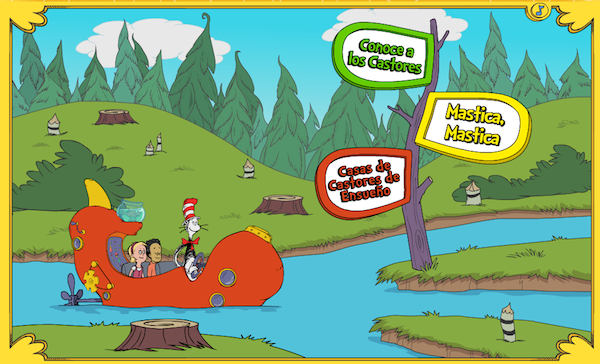 You can check out all of PBS KIDS online games in Spanish HERE. Additional games in Spanish are also available there, including Spanish language-learning games from web-original series Oh Noah! and Maya and Miguel. We’d love to know if you and your niños check out the games and share with us which one is their (and your) favorite! Let us know with a comment below or tweet us @SpanglishBaby with the hashtag #bilingualkids. We liked Trae Algo! I loved that both players were winners. Excelente!! Felicitaciones por la perseverancia y gracias por el dato! Gracias, Paty! Tú ya me has escuchado que no quito el dedo del renglón! This is incredible!!! I have been waiting for fun, Spanish games forever!!! 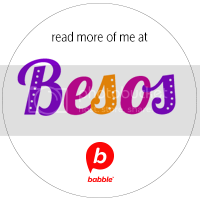 Becky´s last post ..Hispanic Heritage Month Resources + Giveaway! Me encanta! Has anyone been able to watch the PBS shows in Spanish? They are never dubbed for me like some of the Disney Junior shows are. And remember the Papas too! My husband took me from intermediate Spanish classes to a very high level of fluency and together we’re raising our 4yr old son to be fully bilingual . When we take him to visit his grandfather and extended family in Bogota and he blends right in, save that he’s taller than all the other kids his age. We speak Spanish at home 90% of the time and he attends a dual immersion preschool, so we’ve been very lucky with his level of exposure at school and the at home resources we have for him. Anyway, it seems to be less often that it happens this way, but bilingual fathers can nurture their native tongue into their kids too (and even into their wives or partners)! 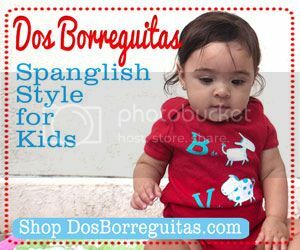 I am already a subscriber to Spanglish Baby newsletter! Hello there, just became alert to your blog through Google, and found that it’s really informative. I’m gonna watch out for brussels. I will appreciate if you continue this in future. A lot of people will be benefited from your writing. Cheers!It is perfect time to make some plans for the future and it is time to be happy. I’ve read this post and if I could I desire to suggest you some interesting things or suggestions. Perhaps you can write next articles referring to this article. I want to read more things about it!Nice post. I was checking continuously this blog and I’m impressed! Very helpful information specifically the last part I care for such info a lot. I was seeking this particular info for a long time. Thank you and good luck.hello there and thank you for your info – I have definitely picked up anything new from right here. I did however expertise some technical points using this web site, as I experienced to reload the site many times previous to I could get it to load properly. I had been wondering if your web host is OK? Not that I am complaining, but sluggish loading instances times will sometimes affect your placement in google and can damage your quality score if advertising and marketing with Adwords. Well I’m adding this RSS to my e-mail and can look out for a lot more of your respective interesting content. Make sure you update this again soon.. If you can’t make this dinner but want us to send you an invite to the next one, jump on the list. i’m not able to’t inform you number 1, it might offend you! My wife and i felt now peaceful Michael managed to carry out his basic research through your ideas he gained in your blog. It’s not at all simplistic to simply happen to be releasing tips and hints people today have been trying to sell. So we discover we need you to give thanks to because of that. 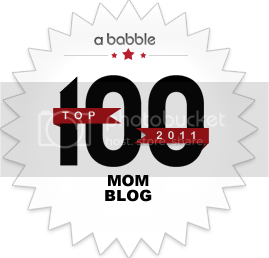 The explanations you’ve made, the easy web site menu, the relationships you help to instill – it’s all incredible, and it’s really making our son and the family know that this subject is brilliant, which is certainly seriously serious. Thank you for all!